The ex-combatants of Kieta and Siwai in the Autonomous Region of Bougainville have for the first time in 23 years, openly shared their grievances and apologized for the atrocities, abuses and killings done to women, men and children of Siwai South Bougainville during the Bougainville Crisis. In an emotional 3-hour ceremony on December 4 in Siwai, two factions – the ex-combatants, (formerly Bougainville Revolutionary Army), and veterans (former Resistant Fighters) from Siwai and Kieta and the families of Siwai missing persons gathered at Upakori in Siwai to outpour their anguish, bitterness, demands and seek forgiveness for the pain and suffering caused during the Siwai Crisis. The Singsingketu ceremony brought together Chris Uma and 30 ex-combatants covering Wakunai, Kieta and Visai and other accomplices from Siwai and the families of the missing persons on the same platform. Singsingketu in the Siwai dialect means to “unwrinkle it or to tell out your grievances or wrongs”. It is equivalent to “Traut or throw- out” session in contemporary conflict mediation. Within the bigger Bougainville Crisis, the Siwai Crisis emanated from a political/leadership struggle within the Siwai leadership soon after the economic blockade. It is the single most vicious civil war, which divided the 15,000 population into the North East pro-PNG Resistance Forces and the South -Western pro-BRA sides of Siwai district. Over 200 atrocities (including deaths, harassment, some people are still missing) committed, social and economic infrastructure destroyed and a way of life disrupted that is slowly returning to normal. “I was very young when my father, Anugu died. I never had the chance to feel his love. My other siblings and I were deprived of his love and welfare when you killed my father. I hold no grudge against you Chris Uma. I love you and all I am asking is for you to tell us the truth – we want to know why our father was killed and we want to know where he is buried,“ said Cornellius, son of the late Anthony Anugu. More than 2,000 people gathered last Friday to hear firsthand, information about the disappearance of the missing persons and prominent leaders of 1992. Late Anthony Anugu and sevenother Siwai leaders were kidnapped during what became known as the Siwai Crisis. 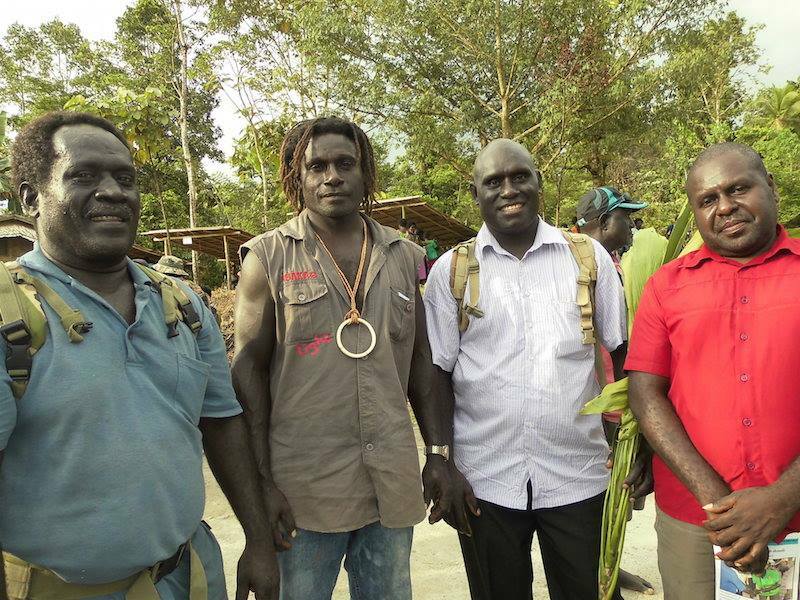 Five of the hostages (Anthony Anugu, former Member of the PNG National Parliament for South Bougainville; Benjamin Kirape, former Deputy Administrator; Joe Rangai, private accountant; Micheal Pareu, a youth Leader; Joe Mo’otung, a youth leader) were killed at Panguna whilst the other two were killed somewhere in Siwai. Since the disappearance of these leaders, illfeelings and animosity continued to date between the Panguna and Siwai peoples until the Singsingketu ceremony. The event was very significant, as it has started a healing process for the victims. The Autonomous Bougainville Government and Australia through the Bougainville Peace Building Program (BPBP) and the Strongim Pipol Strongim Nesen Program (SPSN), are supporting the reconciliation of the Siwai Crisis though a democratic process where women and men fully participate in the reconciliation process. “Last week’s ceremony is the third of a five-stage traditional conflict mediation process for reconciling and progressing the fractured Siwai people towards a path of reconciliation, healing and transformation”, said Dr Naihuwo Ahai. The Siwai Crisis mediation process entails five integrated steps. The first being Nomanigu, which means “friendship” in Siwai dialect and was necessary to unify the families and clans divided by the killings of the eight missing leaders and by subsequent failed mediation attempts. Nomaingu was concluded in October 2014. The fourth stage ‘Kakarepai’ which means to “talk about it” or to mediate the grievances and the final stage ‘Huhu’uketu’ will be in the form of a feast (Ori) where pork meat and shell money are displayed and exchanged as officially confirming that peace has been achieved. A local mediation team called the Anugu Delegation under the auspices of the BPBP’s Siwai District Peace Security Committee is managing the mediation process.